Welcome to the Day of the Dead! 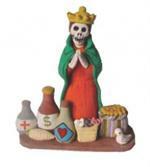 Browse through our large selection of Day of the Dead folk art which includes Skulls, Ceramic Skull Luminaria, Bells, Figurines including Santa Muerta, Bride & Groom, Nativities, Ornaments, Ceramic Necklaces, Ceramic Earrings, Crosses, Ceramic Eggs and much more. Many of these items are handcrafted by local artisians in Peru. They are available in a variety of colors. Styles and colors may vary because of the fact these items are handcrafted. Please call (520) 457-3335 during our normal business hours and we will be glad to help you if you have any questions. 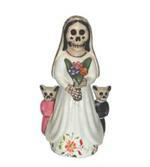 Ceramic Day of Dead skeleton dressed in bridal gown and holding flowers. Upright cat skeletons stand behind her. Ceramic Skull Bead Earrings - D.O.D. Day of The Desd Ceramic Skull Bead Earrings on French Wire style pierced earring findings. Two metal beads are just above the skull. Bead is approximately 3 1/2 inches high and available in two colors. Colorful D.O.D. Ceramic Skull Luminaria. 4 1/2 inches high with wide choice of colors and designs. Skull is slighly stylized in shape. Bright and colorful truck with passenger cargo on top brings five D.O.D. figurines to the traditional party and feasts. Day of the Dead socks are classic black and white Design is white skulls alternating with a decorative accent design. These socks are timeless and go with virtually any style clothing. Day of Dead socks are available in Adult Size only. Hands together in prayer this colorful figurine gives thanks for the bounty at his feet. 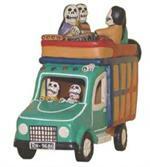 One of our most popular Day of Dead figurines. 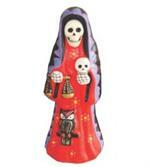 Santa Muerta 6 inch ceramic figure is holding scales and a skull in her hands Wise owl is perched on branch set on the bottom of her dress. Day of The Desd Ceramic Skull Bead Necklace on Adjustable Cord. Bead is approximately 3 1/2 inches high and available in 8 designs. Ceramic Day of the Dead Cross with a total of five skulls with a tapestry type background and a decorative center. Ceramic Day of the Dead Cross with a total of five skulls with a spider web background and a decorative center. Colorful D.O.D. Ceramic Skull Luminaria. 7 inches high with wide choice of colors and designs. Traditional shaped skull with realistic shape. Unique set of angels are Day of the Dead skeletons watching over their loved ones. 3D styling with angels recessed in a niche all set within a frame. 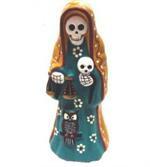 Santa Muerta figurine is holding a skull in one hand and scales in the others for judgement. Wise owl is perched on branch set on the bottom of her dress. 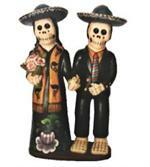 Day of the Dead Skeleton couple holding hands. Ceramic Peruvian Folk Art figurine for use in D.O.D. festivities.